The microphones are directed to the sky, to the trees in the forest of Rambouiller (France). Duration: 03:38. Wind noise in a tree. Some birdsong. Duration: 01:55. Birds singing, drive away, fly. Duration: 00:54. A person is to prune the chainsaw. 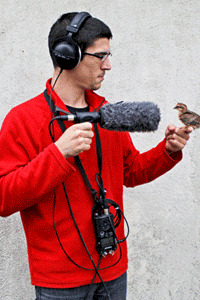 The sound is taken from about 50 meters, with a shotgun microphone. Duration: 00:17. Wind in a very big tree. Grinding of one of its branches. Duration: 02:32. A wood saw cutting a piece of wood. Duration: 00:12. Ax on a large tree trunk. Duration: 00:19. Two pigeons fighting in a tree. Duration: 00:18.